This book kept coming across my radar, so I figured that I had better give it a read. A word of warning for anyone considering picking it up - this book is a 300 page, very graphic argument for vegetarianism; so if you are militantly anti-vegetarian, or have a weak stomach you may want to give it a miss. Basically, Foer investigates the modern factory farm and examines all of the reasons why they are bad - bad for the animals, bad for the environment, bad for our health. There are very graphic descriptions of these farms, the animals living (if it can be called "living") on them, and the high-volume slaughter processes. This book has not convinced me to become a vegetarian, but it has reinforced my already-held beliefs about eating meat. 5 years ago or so, I stopped buying meat at the grocery store, choosing instead to purchase any meat directly from the farmer who raised the animals. I do not eat meat every day (or every week, even). For me, this decision was based not so much on the ethical treatment of animals, but more on the environmental impact of shipping food half way across the country and back again before it reached my table; as well as the taste factor (animals raised in more traditional methods taste better than factory-farmed animals). Here in Thunder Bay, we do not have any factory farms (except for one egg farm), and our only slaughter house (which I have visited) works only on a small scale, processing one animal at a time. Therefore, by buying local meat only, I know that the animal has not been subjected to factory farming practices. Right now in my freezer, I have beef from Mile Hill Farms; pork from Sandy Acres Farm; and lamb from Little Doo's (who are too small to even have a website!). The downside of this is that I have had to eliminate chicken from my diet as we do not have a chicken abattoir and it is illegal to sell meat that has not been killed in a government-inspected abattoir. This may change in the future as there is a move afoot to build a poultry abattoir; so for now we just won't tell anyone about the "illegal" chicken that is in my freezer waiting to be cooked. Now if I could just find someone to sell me the live chicken (or if the city by-laws would change to allow urban chickens), I could do the deed myself; but for now I will just hope that some day soon I will be able to eat chicken again. 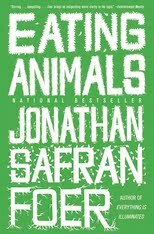 The author, Jonathan Safran Foer does admit that choosing only to eat ethical meat is another option to vegetarianism; but states that he himself has chosen vegetarianism to satisfy his conscience. His main arguments for this decision seem to be that it is the only way to be 100% sure; and that if other people see you eating meat, it can be seen as a justification that eating any meat is OK (i.e. vegetarians can set a good example for others). There was lots in this book that I agree with (even if I am not a full-time vegetarian myself). I already knew about the environmental and ethical and health concerns of factory-farmed meat. I did find this book to definitely be written from a North American cultural bias (e.g. the opening chapter using pet dogs as a comparison standard - in most parts of the world, dogs are not considered "pets" - in fact in Swahili, the same verb is used to refer to keeping dogs as you would use for goats, cows, or chickens). And all of the facts and data are American (as in USA) in origin. I am now curious to learn more about Canadian regulation and enforcement, as I know that while factory farms do exist in Canada, our farming legislation is very different here than in our neighbours to the south. So for now, I will carry on buying my local, ethically raised meat. When I go out to restaurants, unless I know that they are buying from our local farmers, I will usually choose the vegetarian option. My biggest dilemma comes when eating at the table of friends and family. Here, I usually prioritize fellowship over meat-eating issues; but I rarely miss a chance to bring ethical meat issues into the discussion. Supper tonight? A lovely vegetarian chick-pea curry! Takes courage to make this giant step to vegetarianism. When (if) I do it, it'll be the ethical and health reasons you mention. Good review - I'd be scared to read it! I am not a vegetarian. I love to read so i don't have any problem with reading this book. I have read more than 100 books in lifetime, ha ha ha. Just kidding your review is awesome. thanks.